Rajasthan, India. 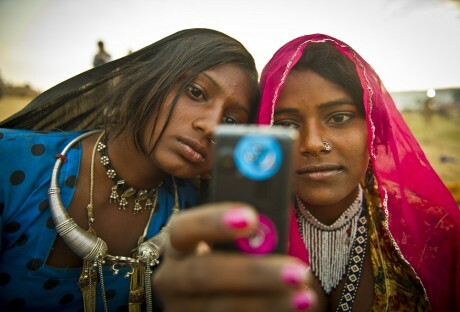 13 year old Anita (right) and Subita Devi take a photograph using a mobile phone at the world's largest annual cattle fair in the desert town of Pushkar. A trawl through information about the impact of ICTs and girls can be both inspiring and hugely disheartening. Women and girls face significant barriers in accessing communications technology but it is exciting to see what can be achieved when they have the tools. Melissa Albricht sums this up in an article on the website Mobile Active. She describes how mobile phones, for example, have helped women in developing countries by giving them greater autonomy and empowering them socially and economically. The downside is that the majority of women in developing countries still have no access to a mobile phone, and when they do, it can be seen as threatening the status quo. Mobile phones hold out the promise greater autonomy for women but the old barriers remain. We’ve learned a great deal in the last 20 or so years about ICT for development. We know that enabling access takes more than creating infrastructure and making hardware and software available. The gendered economic, social, educational and cultural factors affecting the lives of women and girls have an impact on their access to technology. The NGO Plan International’s report Because I am a Girl highlights six factors preventing girls from taking advantage of ICT: they face discrimination because they are girls; boys are favoured when there is access to ICT; girls lack confidence as a result of this and they are further disadvantaged by language and literacy difficulties, shortage of time due to domestic duties, lack of financial resources and lack of freedom, the freedom for example, to go to an internet café. Of course these barriers play out in a number of ways depending on the context. The educational opportunities and social and cultural constraints faced by young women in Nairobi are not the same as those faced in rural Bangladesh. To address the barriers it is important to look at both the social and the communication context. In other words, we need to understand the gendered nature of cultural, social and economic restrictions, and how unequal power and gendered relations with men and boys affects girls’ use of ICTs. And then we can determine – by working with girls – the steps needed to increase their access to the ICTs potentially within reach. Working with girls to establish the constraints on their time and freedom and why those constraints exist is what leads to improved access. It can be something as simple as finding a better time and location for an ICT class or by lending girls MP3 players with downloaded content which they can listen to while at home doing domestic chores. Access is just one (albeit very large) part of the story but we also need to consider design. Technology is not designed for the needs of poor and marginalised girls. Most hardware and software is designed a million miles away from their lives, designed within a highly educated male-dominated profession; a fact highlighted in the International Technology Union’s report A Bright Future in ICTs : Opportunities for a new generation of women. Consequently, the needs of the information-poor, particularly girls and women, are neglected in both the theory and implementation of open systems. These are the people who would value greatly and benefit most from access to the environmental, social, political and economic information being made public. But once again, they are the very ones being excluded due to a lack of tools, capacity and awareness. Unless the tools for accessing and interpreting this data are designed with sensitivity to equity and context, and with women and girls explicitly in mind, this will remain the case. In other words the most vulnerable remain the least connected. Should anyone be in any doubt about the potential, there are great examples of what women and girls can do when they are involved in technology design. Akirachix in Kenya is an organisation mentoring young women to develop their ICT careers. They count amongst their mentors Jamilla Abass and Susan Oguya who developed Mfarm, a tool for Kenyan farmers, which uses SMS to share information about retail prices and to buy and sell products at favourable prices. But they remain the exceptions rather than the rule. The participatory design movement has stressed the need to involve the eventual users but in spite of this technology design involving poor people is mostly an afterthought, if thought of at all. The development sector has made some efforts to address this but most people still use hardware, software and applications designed for the mass market.These technologies are designed for the better resourced and better connected. We have seen how with the rise of mobile phones in Africa people found methods to get around the ‘one person one phone’ design assumptions of phones and software produced for an affluent global market in order to make them work for collective use. As the African market grew, mobile phone developers started to design systems for shared phone use and to take into account that one mobile phone might be shared by a family or even a village. Setting aside the commercial drive of technology development for a moment, what if mobile phone systems had been designed with rural adolescent girls in Bangladesh in mind? Instead of adapting and re-designing ‘down’ from technology designed for the affluent as the way to enable access by the poor, why not start from a principle of equal access and design up? If technology is going to work for those who have the least access to it and the greatest need for it, they need to be involved in its design and testing from the earliest stages. Developers need to to spend time with poor and marginalised women and girls. They need to listen to them and learn from them, and find out how gender, poverty and exclusion affect their of technology. And also involve them in thinking about design and recognise their creativity. What method would you use to design technology with and for poor and marginalised girls?